Kevin Krajick/Earth Institute, Columbia University. Decades of drought, interspersed with intense monsoon rains, may have helped bring about the fall of Cambodia's ancient Khmer civilization at Angkor nearly 600 years ago, according to an analysis of tree rings, archeological remains and other evidence. The study, published this week in the journal Proceedings of the National Academy of Sciences, may also shed light on what drives—and disrupts—the rainy season across much of Asia, which waters crops for nearly half the world's population. Historians have offered various explanations for the fall of an empire that stretched across much of Southeast Asia between the 9th and 14th centuries, from deforestation to conflict with rival kingdoms. But the new study offers the strongest evidence yet that two severe droughts, punctuated by bouts of heavy monsoon rain, may have weakened the empire by shrinking water supplies for drinking and agriculture, and damaging Angkor's vast irrigation system, which was central to its economy. The kingdom is thought to have collapsed in 1431 after a raid by the Siamese from present-day Thailand. The carved stone temples of its religious center, Angkor Wat, are today a major tourist destination, but much of the rest of the civilization has sunk back into the landscape. 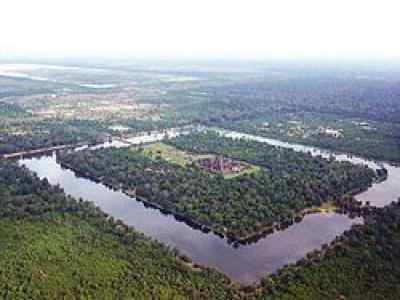 "Angkor at that time faced a number of problems—social, political and cultural. Environmental change pushed the ancient Khmers to the limit and they weren't able to adapt," said the study's lead author, Brendan Buckley, a climate scientist and tree-ring specialist at Columbia University's Lamont-Doherty Earth Observatory. "I wouldn't say climate caused the collapse, but a 30-year drought had to have had an impact." 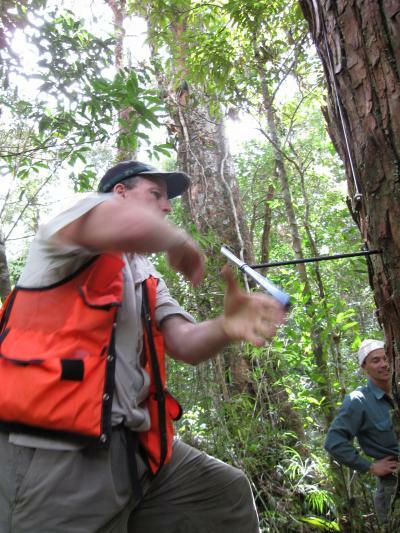 Scientists led by Buckley were able to reconstruct 759 years of past climate in the region surrounding Angkor by studying the annual growth rings of a cypress tree, Fokienia hodginsii, growing in the highlands of Vietnam's Bidoup Nui Ba National Park, about 700 kilometers away. By hiking high into the mountain cloud forests, the researchers were able to find rare specimens over 1,000 years old that had not been touched by loggers. 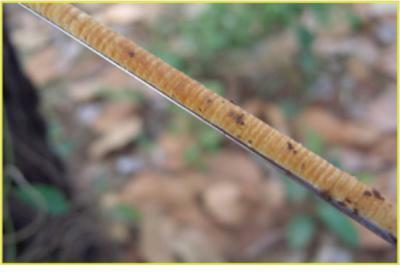 After extracting tiny cores of wood showing the trees' annual growth rings, researchers reconstructed year-to-year moisture levels in this part of Southeast Asia from 1250 to 2008. The tree rings revealed evidence of a mega-drought lasting three decades—from the 1330s to 1360s-- followed by a more severe but shorter drought from the 1400s to 1420s. Written records corroborate the latter drought, which may have been felt as far away as Sri Lanka and central China. The study also finds that the droughts were punctuated by several extraordinarily intense rainy seasons that may have damaged Angkor's hydraulic system. During a normal monsoon season, Angkor's hydraulic network could have handled heavy downpours, but after extended droughts, the system may have been vulnerable to massive siltation and clogging, the study suggests. Layers of coarse debris and other sediments found blocking some canals appear to have been laid down suddenly. In other spots, apparently sudden erosion cut canals as much as 8 meters below the surrounding landscape, potentially destabilizing the hydraulic system. Archeologists have found additional evidence that canals were rebuilt and rerouted to cope with water shortages. In compiling the longest tropical tree ring record to date, researchers found that the third-driest, and the driest, years in the last 760 years occurred back to back in 1402 and 1403, about three decades before Angkor's fall. The second driest was 1888, which coincided with the 1888-1889 El Niño, a cyclical warming of the tropical Pacific Ocean. By correlating known El Niño cycles measured with modern instruments, researchers have documented how the cyclical warming and cooling of the tropical Pacific Ocean brings rain to some places and drought to others. The authors of the current study and other researchers suggest that El Niño, possibly abetted by longer, decades-long cycles across the Pacific basin, may have played an important role in shutting down the monsoon rains in this region, creating withering droughts in the past. Some scientists suspect that warming of the global climate may intensify these cycles in the future, raising the possibility of alternating Angkor-like droughts and destructive floods that could affect billions of people. "Both human society and the erth's climate system are complex systems capable of unexpected behavior. Through the long-term perspective offered by climate and archaeological records, we can start to identify and understand the myriad ways they may interact," said study coauthor Kevin Anchukaitis, a tree ring scientist at Lamont. "The evidence from monsoon Asia should remind us that complex civilizations are still quite vulnerable to climate variability and change."